U.S. soldiers direct traffic outside the residence of the Peruvian ambassador to Panama, right rear, in Panama City on Jan. 9, 1990. In December 1989, U.S. President George H.W. 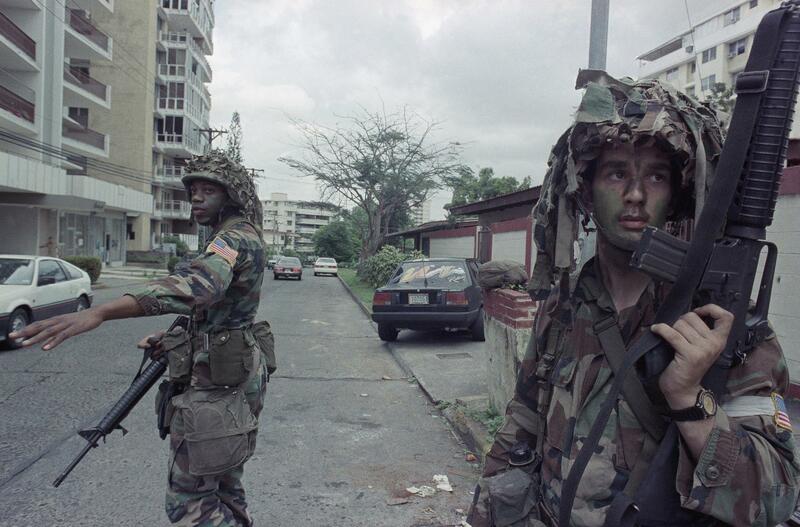 Bush sent thousands of troops to Panama to arrest the country's leader, Manuel Noriega. When President Trump spoke in Florida earlier this month, he issued a stern warning about Venezuela: Members of the armed forces who continue to support President Nicolás Maduro "will find no safe harbor, no easy exit and no way out," he said. "You will lose everything." Trump said the administration wants "a peaceful transition of power, but all options are open" — suggesting the possibility of military involvement. Vice President Pence visited Colombia Monday and announced new economic sanctions against Venezuelan politicians aligned with Maduro. 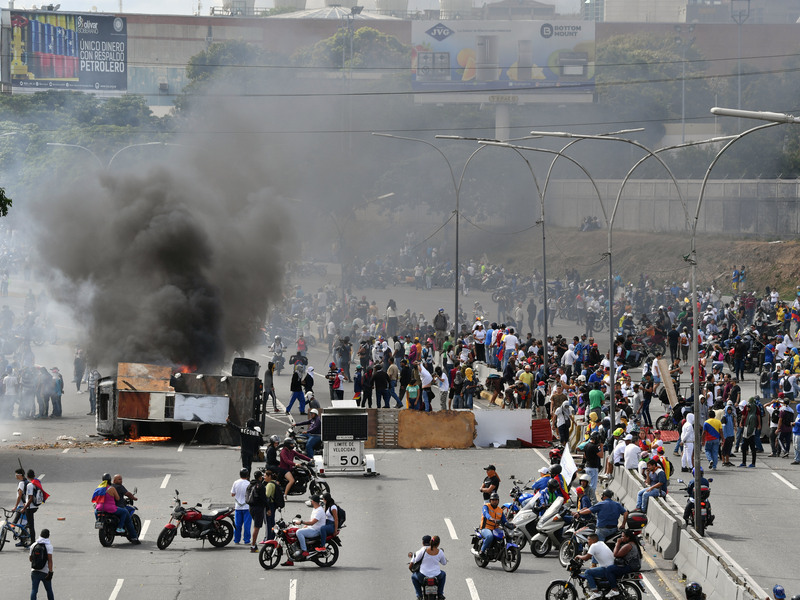 That followed a weekend of violent clashes when Venezuelan security forces blocked most of the humanitarian aid that U.S.-backed opposition activists tried to bring into Venezuela. Four people were reported killed and hundreds injured. 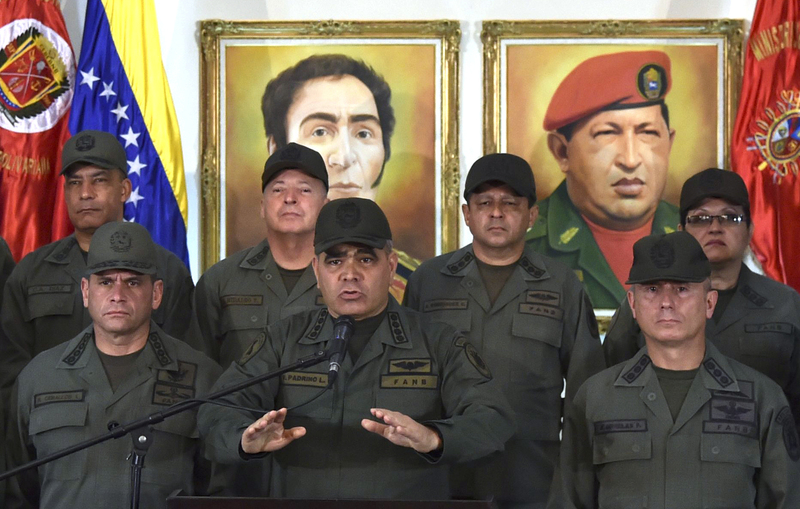 Venezuelan Defense Minister Vladimir Padrino delivers a speech while surrounded by military men in Caracas on Tuesday. Padrino reiterated the military's "unrestricted obedience, subordination and loyalty" to President Nicolás Maduro. While many Venezuelans disapprove of Maduro and have called for international assistance, many in Latin America are wary of America's moves. Even for some of Maduro's enemies, Washington's efforts to oust the Venezuelan leader raise concern because of the history of U.S. intervention in the region. It is "a long history that starts in Mexico," says Enrique Krauze, a noted Mexican historian. The Mexican-American War, the brutal two-year conflict in the mid-19th century, ended with Mexico losing — or as Krauze says, being robbed of — half its territory. "It would be hard to name a country where the United States didn't have an intervention," he emphasizes. The United States participated, directly or indirectly, in Latin American regime change more than 40 times in the last century, according to historian John Coatsworth. That figure doesn't include a number of failed missions like the 1961 Bay of Pigs assault in Cuba. Some of the more stinging U.S. moves included the ouster of democratically elected governments in Guatemala in 1954, in Brazil a decade later and in Chile in 1973. Chilean President Salvador Allende was deposed in a violent coup by CIA-backed opponents, and the U.S. government long supported his replacement, the dictator Gen. Augusto Pinochet. 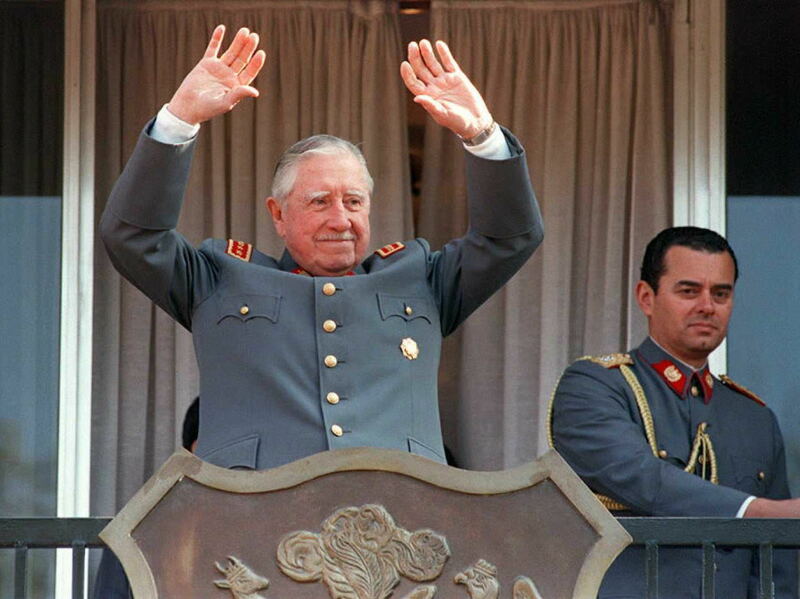 Gen. Augusto Pinochet waves to supporters from the balcony of his residence in Santiago, Chile, during the celebration of the 22nd anniversary of the 1973 military coup he led to oust President Salvador Allende. In addition to covert support for insurgencies, the U.S. has invaded its southern neighbors numerous times. For instance, the U.S. launched invasions of the Dominican Republic (1916), Grenada (1983) and Panama (1989). The motives were varied and are often still debated. Writing in Harvard University's ReVista magazine, Coatsworth says, "two factors seem to have been crucial in tipping decision makers toward intervention: domestic politics and global strategy." Much of the interference occurred while America was competing against the Soviet Union for influence around the world, even as U.S. leaders sought to shore up political support at home. One bloody chapter that recently re-entered debate is the U.S. government's roles in Central America's civil wars in the 1980s, including support for death squads in El Salvador and Contra guerrillas in Nicaragua. The Trump administration's special envoy for Venezuela, Elliott Abrams, was convicted of withholding information about the Iran-Contra scandal from Congress but later received a pardon from President George H.W. Bush. This month, Congress members grilled Abrams and questioned whether he would speak truthfully. In 2002, the U.S. government allegedly had prior knowledge of an abortive coup against Venezuela's then president, Hugo Chávez, although President George W. Bush's administration denied any involvement. Abrams was a senior White House official at that time as well. Now, historian Krauze says, the world wants to stop the humanitarian crisis he calls the "slow genocide" of the Venezuelan people. Venezuela was once considered the richest country in Latin America, and it holds the world's largest oil reserves. Many world leaders, analysts and rights groups blame Maduro for enabling the country's spiraling problems such as hyperinflation, crime, hunger and shortages of medicine and basic goods. Venezuelan opposition demonstrators set up a barricade to block a street in Caracas during a protest against the government of President Nicolás Maduro on Jan. 23, 2019, the anniversary of the 1958 uprising that overthrew Venezuela's military dictatorship. The U.S. and more than 50 other countries' governments have issued statements recognizing congressional leader Juan Guaidó as Venezuela's rightful president, according to Prodavinci, an independent website for Venezuela analysis. The Maduro administration said earlier this month it had enlisted about as many countries, including China and Russia, in its support. Most Latin American governments now back Guaidó. Mexico's president says the country is neutral and is calling for dialogue. With a combination of sanctions, diplomatic pressure and heightened warnings, the United States is playing a difficult balancing act. It cannot be seen as leading the charge in Venezuela, says John Feeley, who resigned as U.S. ambassador to Panama last year, later citing differences with Trump. "Precisely the history of U.S. intervention in Latin America is such that it always seems to engender a worse backlash than the original issue that mattered to American interests," he says. Mexico's former foreign minister, Jorge Castañeda, warns that the United States should not take too large a role in Maduro's ouster. While Bolivia, Cuba, El Salvador and Nicaragua continue to back the embattled leader, Castañeda fears that a larger U.S. leadership role would rally more of Latin America's left to Maduro's defense. "It's not so much that it should be leading from behind; it shouldn't be leading period. It should be doing what it is doing, not less, but not more," Castañeda says. Yet, with speeches like the one in Miami, Trump was working to "Americanize the crisis," according to Greg Weeks, a University of North Carolina professor who edits the journal The Latin Americanist. "The more you Americanize the situation, the worse the eventual result for the average Venezuelan," he wrote on his blog on Tuesday. "It badly undermines whatever government comes next and increases the chances of armed insurrection." With Trump campaigning for re-election, Weeks assessed from the speech that U.S. domestic politics are a strong force behind the president's push to oust Maduro. Former ambassador Feeley says he hopes Trump takes a diplomatic path. The repercussions of a U.S. intervention in Venezuela would undermine recent progress made in the region, he says. "I think that the last 25 years of U.S. Latin American diplomacy have actually gone a long way," he says, "via trade agreements, people-to-people diplomacy to pushing back against that legacy."